The bleachers at Greenwich High School's Cardinal Stadium in Greenwich, Conn., photographed on Wednesday, March 26, 2019. The bleachers are in need of replacement and the school board proposed a $3.8 million request and a plan for a three-phase project. The Budget Committee had recommended lowering the BOE’s initial $8 million request for a two-year stadium project to just $1.3 million to fix only the bleachers. GREENWICH — The home-side bleachers in Cardinal Stadium are closed pending repair to bring them up to current code or replace them, Superintendent of Schools Ralph Mayo announced Monday evening. Some fans were sitting on the bleachers for a junior varsity lacrosse game between Greenwich Academy and Greenwich High School Monday, but they will not be used going forward, Mayo announced. The graduation ceremony is set for Monday, June 17. Replacement of the approximately 50-year-old bleachers is a priority project in the Greenwich Public Schools 2019-20 capital budget, pending RTM action. The body is to vote on the budget at its May 13 meeting. “Additional and recent concerns” about the bleachers prompted the district and the town Building Department to conduct inspections. While the bleachers had some remedial work and temporary shoring installed in 2016, both the district’s engineer and town building officials concur that the bleachers need to be brought up to current building codes, according to the district. At the time the bleachers were erected, it appears they were built to a standard of 60 pounds per square foot. Currently, code requires that the structure hold 100 pounds per square foot. The district is researching options for short-term repair and timelines for replacement — if the capital project is approved. Athletics and accessibility advocates say the stadium is a safety hazard for able-bodied fans, prohibitive to those with disabilities and inconvenient for Greenwich athletic teams and their visiting rivals. The Board of Education and the Greenwich Athletic Foundation’s first priority — to fix the bleachers — could solve these problems. 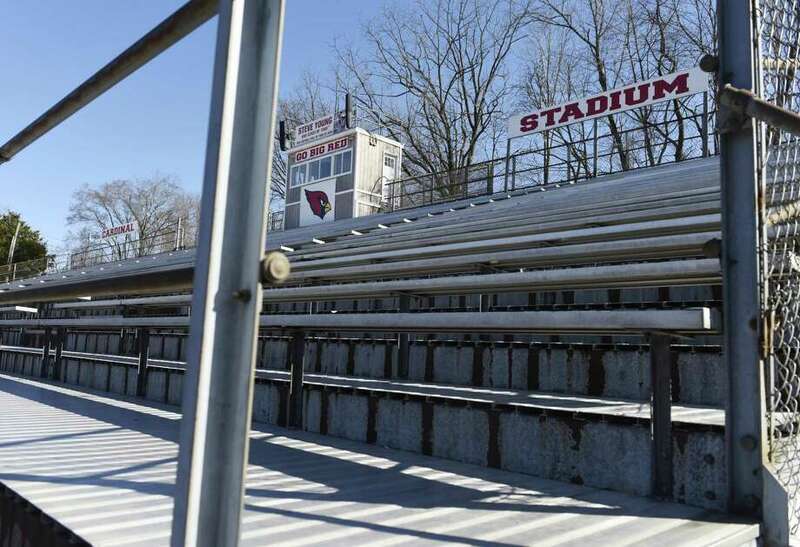 Last month, the father of a New Fairfield lacrosse player reported feeling the bleacher sagging under his foot on the visitor’s side of Cardinal Stadium. No one has been hurt by the decaying stands — yet. The bleachers are part of a more encompassing Cardinal Field development project that began with an initial feasibility study conducted in 2017-18, calling for replacement of the aging bleachers, among other facility, safety and use improvements.